Developer GayaSimulation have today debuted a new airport to compliment their currently in-development Courchevel Airport (LFLJ) scenery. The new airport, Méribel (LFKX), is located only about 10 kilometres from it's much more renowned neighbour. In a post on Facebook touching on both their current projects, Gaya developers say of Courchevel: In the second half of the post, they go on to say that not long after the release of LFLJ, they plan to release Méribel too. There are no screenshots of the new scenery currently available. You can find out more about GayaSimulation Courchevel via a previous article. 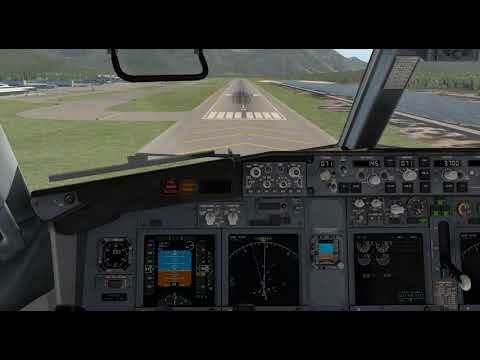 SOURCE INFO DEVELOPER POST LINK : NEWS SITE ARTICLE LINK : GayaSimulation Announces Méribel Airport Alongside Courchevel | Threshold WWW.THRESHOLDX.NET Developer GayaSimulation have today debuted a new airport to compliment their currently in-development Courchevel Airport (LFLJ) scenery - Méribel Airfield (LFKX). | Threshold: Question the Answers. Military developer FlyingIron Simulations have formally announced their F-117 project for Laminar's sim, after posting a teaser of it last month. The developer has previous experience in the X-Plane field too, following the release of the Supermarine Spitfire Mk.IX last year. Threshold were lucky enough to review the Spitfire, so if you'd like to see if it's worth buying, find more information here. In a post on their Facebook page, FlyingIron developers provide some background on the aircraft. "For our simulation of the Nighthawk, we have invested heavily in purchasing all of the available documentation that has been declassified for the Nighthawk. This includes Operating Manuals, Utility Manuals, Performance Data & Testing Reports, Engine Data, Pilot Checklists and more. The declassification of the F-117 & its documentation have allowed us to truly dive into the systems and procedures and create a realistic simulation of the aircraft from the ground up." ‍ To learn more about FlyingIron's previous X-Plane works, check out our review of their Supermarine Spitfire Mk.IX. SOURCE INFO DEVELOPER POST LINK : NEWS SITE ARTICLE LINK : FlyingIron Simulations Formally Announce F-117 Nighthawk | Threshold WWW.THRESHOLDX.NET Military development team FlyingIron Simulations have formally announced their F-117 Nighthawk project for Laminar's sim, after posting a teaser of it last month. | Threshold: Question the Answers. The almighty UH-1 by Nimbus Simulations comes with some extra features that raises the bar on the helicopter flight simulation scene. Nimbus has announced their addon will come with a maintenance module which will keep tabs on your several factors and, eventually, cause failures. While this sounds great, I immediately thought about the issues the DCS Huey has with the failures implemented by Belsimtek in which the helicopter has a catastrophic failure if you let the temperature rise. I asked Nimbus about it and actually told me they don’t use the DCS Huey as not to be biased but that their model will not simply fail. It will be something progressive if you abuse and don’t pay the required attention to it. They described the module as being “[…] almost complete, exceeding the limits will cause incremental damage. Engine, transmission, rotor, battery and hydraulic fluid must be maintained to guarantee a safe operation.” Great! The team also released a few screenshots showing some texture improvements and mentioned a mode which will allow you to move to the machine guns on the sides as your “co-pilot” will maintain heading, altitude or bank at a constant rate. Time for some pew pew pew, I guess? Nimbus is planning in releasing they Huey “soon”. Until then, enjoy the screenshots! SOURCE INFO DEVELOPER POST LINK : Nimbus Simulation Studios - Home | Facebook M.FACEBOOK.COM Nimbus Simulation Studios. 1,422 likes. Add-ons for the beautiful X-Plane by Laminar Research. NEWS SITE ARTICLE LINK : Nimbus Simulations’ Huey for X-Plane will have a maintenance module • HeliSimmer.com WWW.HELISIMMER.COM The almighty UH-1 by Nimbus Simulations comes with some extra features that raises the bar on the helicopter flight simulation scene.